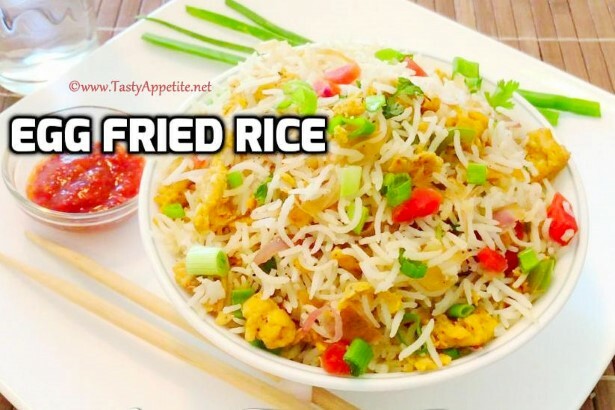 Here comes the easy & quick restaurant style egg fried rice recipe. It tastes simply delicious & makes a perfect dish for a tummy filling lunch or dinner. This yummy egg fried rice is a huge favorite among kids and makes a crowd pleaser recipe at get-togethers. The vibrant color of carrots and capsicum along with scrambled eggs adds attraction to this fried rice. Try it at your home to with this easy video recipe! Drain water & set aside. Add 4 to 5 cups of water to it and allow to boil. Add the basmati rice to it. Add 1/2 tsp of salt, 1 tsp of oil and squeeze few drops of lemon juice. Once the rice starts boiling, stir gently and cook. You can see the rice is cooked after approximately 5 mins as shown in video. Strain the cooked basmati rice in strainer and drain the water. Spread the rice in a bowl and allow to cool. In a small mixing bowl, add 2 tbsp of water. Add 1/2 tsp of salt, a pinch of turmeric pwd, 1/2 tsp of pepper pwd and 1/4 tsp of red chilli flakes. Break the eggs and drop into mixing bowl. Add the egg mixture and cook. Scramble the eggs in medium flame. Turn off flame and take aside the scrambled eggs. Heat 2 tbsp of oil in frypan. Add grated garlic, ginger and green chilli. Add sliced onions, salt and toss. Add sliced capsicum, spring onions white and diced carrots. Saute the veggies in high flame. Add soya sauce and vinegar. Add scrambled eggs and cooked basmati rice. Keep tossing until the rice is well fried. Sprinkle freshly chopped spring onion (green) and coriander leaves. Lipsmacking flavorful delicious Egg fried rice is ready.